At school Dr Sara Kirabo was a prefect for health issues. At university she participated in health education campaigns to halt the spread of the human immunodeficiency virus (HIV). She learnt counselling to help fellow students cope with the infection. Her interest in counselling led her into a career in psychological medicine. After working as medical officer in a mental hospital she took and passed the Professional Linguistic Assessments Board (PLAB) tests, did a clinical attachment, and found a post as a senior house officer (SHO) in psychiatry in a desirable hospital. The first part of this article discusses how Sara wrote her curriculum vitae (CV). The second describes how Sara handled the job interview. Sara, her CV, and the doctors named in it are fictitious. Names of known institutions are used to maintain a sense of reality. Sara wanted a CV that would get her interviews for SHO posts in psychiatry. 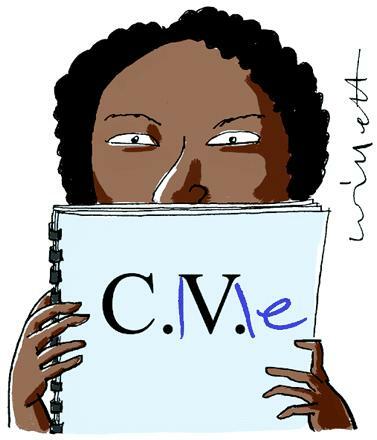 She read about writing CVs,1 talked with junior doctors and sought advice from her clinical attachment supervisor. Sara knew that when a recruiter started reading her CV, she would have less than a minute to convince them of her suitability for a post. She wrote a CV that is concise, attractive, and easy to skim in search of important information. It was printed on good quality, white, 80 g/m2 paper. It would not be the weight or cost of paper on which the CV was printed, but the content and quality of her writing that would impress consultants when they shortlisted for interviews. Sara wrote the CV in an active language showing that she is an active and decisive individual: she was careful with grammar and spelling, used a spellchecker, and then read the CV carefully. Sara was afraid that bad spelling and poor grammar might lead to rejection of her application. Let us briefly clarify a few items in “Usual format for medical CVs” that puzzled Sara as she wrote her CV. The heading announces the subject of the document and avoids the need for a front sheet naming the doctor described in the CV. Sara's CV is headed: Dr S Kirabo MB ChB. Sara's contact details are adequate for the recruiter to telephone, email, or send her a letter. Her personal identity does not include her marital status, spouse's nationality or size of her family (she is married and has two young kids). She could have included her hepatitis B status. Sara's qualification is MB ChB. When she gets other degrees or membership of the royal college of psychiatrists she will add them to her CV. Her pass at PLAB tests is not a qualification; so she listed it separately. When she passes part 1 MRCPsych she will list it separately too till she gets the full membership. She will not include failed exams. Sara's career plan was concise and described how the job would help her achieve it. It was on the first page of her CV. Sara summarised skills she gained from her career. In future when she applies for a specialist registrar (SpR) post she will summarise her skills and achievements to highlight what the employer would get by appointing her to the post. The education entry highlights leadership responsibilities held at high school and university to indicate Sara's leadership potential. She has no need to hide or minimise any aspect of her medical career. All legitimate medical work, including national service, should be included in a CV. Interviewers like to ask questions about atypical careers. Sara accounted for significant gaps in her career. She had heard that some consultants scrutinise CVs for career breaks and discard those with long unexplained gaps. Sara described her research activities, listed conferences attended and presentations made. She followed the Vancouver style when listing her publications.4 All publications, be they journal articles, abstracts in conference proceedings, book chapters, or whole books, qualify for listing in a CV whether done abroad or in the United Kingdom. Sara listed her hobbies to show that she has a life outside medicine. She gave names and contact details of two referees. After settling in her new job she will ask two suitable consultants for permission to name them as referees. References from consultants a doctor has worked with are more influential than those from supervisors of clinical attachments. Sara did not pay a commercial company to write her CV. Such companies do not write CVs, but type, edit, and print (produce) documents from information supplied by clients. They print the document on unnecessarily expensive paper and charge a lot of money for the service. 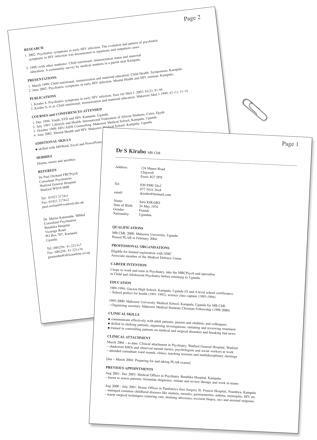 By following “Usual format for doctors' CVs” Sara crafted her CV and asked her supervisor's secretary for advice on getting it professionally typed and printed. Because she asked politely, the secretary typed and printed the CV free of charge. She could have directed Sara to one of several commercial typists nearby. Sara recently brought her an ornamental basket from Uganda. An interview is an occasion when individuals or groups meet and talk with each other, with one side asking questions and the other answering them. 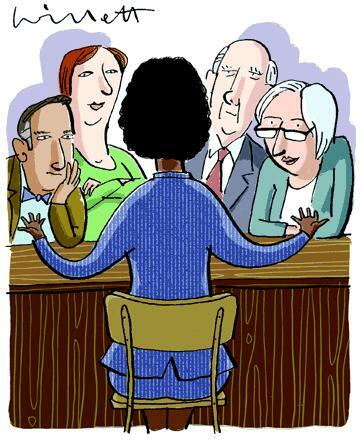 In a job interview an applicant (interviewee) is seen and questioned by an employer or their representative to determine the applicant's suitability. Is she the most suitable? Did Sara have the right personality and drive? Was it the right job for her? Will she do the job? If interviewers felt that although capable, Sara would not willingly perform her duties, they would not appoint her. Will she fit in? People want somebody who will fit in nicely. Sara would be appointed if interviewers felt she would fit into the team—character, drive, dependability, initiative, congeniality, etc. After sending out 60 applications, Sara was shortlisted for interview by two mental hospitals—one in Yorkshire and the Maudsley in south London. The interviews were on the same date. Her supervisor recommended attending the London interview. Sara did not have to visit the Maudsley. She could have rung and spoken with the incumbent of the post she would be interviewing for. But as she did not know London, she visited the hospital, noted the route and where the interview would be held. She met people in the post, some nurses, and one consultant. What is the most challenging clinical situation you have met? What did Sara look like (appearance, confidence), and sound like (voice, language)? Critical decisions (trust and distrust, like and dislike, etc) are often made after brief encounters—interviews. Only qualified candidates would be interviewed. So, it would not be qualifications but the impression she created by her appearance, confidence, speech, and demeanour that would determine the outcome. Sara dressed for a professional interview and not a party. She wore smart, clean, and socially appropriate clothes—not a T shirt or jeans. She could have worn trousers, a shirt, and a jacket, but she felt more comfortable in a skirt, a shirt, and a matching jacket. She took her hepatitis B serology status, eligibility for limited registration, and passport with her. At the human resources department Sara made her inquiries politely and waited calmly. On entering the interview room she was introduced to three consultants and a human resources officer. She shook hands with a moderately firm grip and made direct eye contact with panel members as they were introduced to her. She sat in the chair indicated by the chairman, made herself comfortable, and waited for questions. She spoke clearly, concisely, and simply; neither whispering nor shouting. She watched interviewers' faces to see if they heard and understood her answers. She did not draw attention to her weaknesses nor argue with interviewers. She smiled and laughed appropriately. Sara was asked about her work in health education and counselling fellow students. She gave succinct but full answers. Interviewers were impressed by her understanding of the HIV pandemic. Sara was aware that she might be asked about past failures. She was prepared to talk about one case that did not go well. The cause of mishap had been identified and lessons learnt. She had reflected on the incident and could discuss it confidently and rationally stressing the lessons and not the failure. She was not asked. Finally, she was asked if she had any questions. She thanked the panel for the opportunity, said she had talked with doctors and nurses on the ward, and had no questions. She was told a decision would be made later that afternoon and that she could wait for the result if she wished. She said she would wait. She left the interview room confidently and politely. At 5.30 pm., three of the 10 interviewees were offered jobs. Sara was among the successful doctors. She accepted the job offer. Turya EB. Your career after PLAB: survival tools for young doctors. Manchester: Edukom, 2003. McErin S. Writing the medical CV. Manchester: Edukom, 2004. EBT acknowledges the help of a Ugandan senior house officer whose career inspired Sara's CV. Strunk W, White EB. The elements of style. London: Long-man 1999. Ritter RM. The Oxford manual of style. London: BCA for Oxford University Press, 2002. GMC. GMC case book: doctor suspended after making false claims. GMC News, 14 October 2002.
International Committee of Medical Journal Editors. Uniform requirements for manuscripts submitted to biomedical journals. Ann Intern Med1997;126: 36-47.